Michael Redd will return to the Bucks Monday, after All-Star weekend. By all accounts, he won’t play right away, but will work to get himself “in a position” where he could possibly play. Redd’s in the final year of a contract that pays him $18.3 million this season, more than Carmelo Anthony, more than anybody on the Celtics not named Kevin Garnett, more than anybody on the Lakers not named Kobe Bryant. This makes Redd very valuable to any team looking to cut costs next season, including the Bucks, who could use some payroll breathing room after last summer’s flurry of contract activity (Drew Gooden, John Salmons, Keyon Dooling). Nobody in Milwaukee media has bothered to ask GM John Hammond, with the trade deadline eight days away, whether a trade is a possibility. Those questions will surely arise once Redd is back in camp. Currently, the Bucks insurance is reimbursing the team 80 percent of the cost of the contract, due to Redd’s long rehabilitation from a second knee surgery. $18.3 million! For Michael Redd? It’s insane, but there was very little the Bucks could do to avoid it back in 2005 when the deal was struck. Such are the NBA economics that spun out of control in the last decade, as teams wrote ridiculous agreements with All-Star players such as Redd, Tracy McGrady and Gilbert Arenas, not so much because they were forced to, but because the ethos of the league and the setup of the league’s collective bargaining agreement said that superstars bring in the fans, and that every team should have one — a superstar, that is, not a fan (even the Clippers had a fan or two before Blake Griffin). Even very good, borderline All-Star players such as Richard Jefferson got similar deals (RJ’s still working off his final year down in San Antonio). 2) Wanted to reward Redd with a contract comparable to Allen’s $17 million per season deal. The market dictated that Redd should not be paid quite at Allen’s level, so the Bucks basically made a 5-year, $14.5 million per year offer (exceeding what the Cavs were able to offer over five years) and tacked on the outrageous sixth year “player option” to exceed the total of Allen’s contract. Was the sixth year necessary? Probably not, but five-six year agreements with the final year an option for players were in vogue back then, and, well, nobody in the Bucks organization wanted to see Redd suit up alongside Lebron James, unless it was for an All-Star game. So here we are, the 2011 trade deadline fast approaching, the Bucks needing a shot in the arm and Redd (probably) nowhere near playing shape. This may be little more than an insurance check to upgrade Redd’s status and handle the legalities of his sunsetting disability status. It may mean the Bucks have brought him back into the news to draw trade interest. It may mean that Redd has rehabbed his way into shape to play. It almost certainly means that Redd doesn’t want his career to end, and wants to show the NBA that he can play next season. 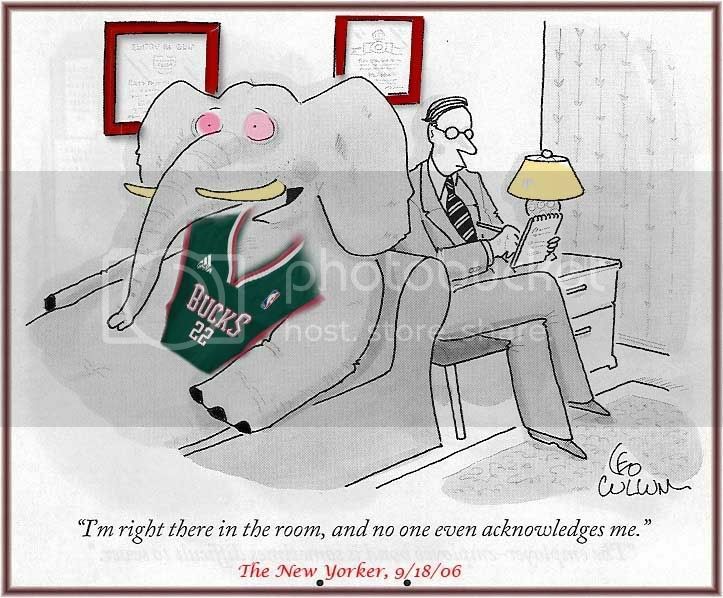 On Monday, the elephant returns to the Bucks locker room. (Special thanks to Bucks fan Sidney Lanier, the originator of the altered New Yorker artwork above). This entry was posted in Bucks History, The Jinx and tagged Cleveland Cavaliers, Gilbert Arenas, John Hammond, Lebron James, Michael Redd, Milwaukee Bucks, Ray Allen, Tracy McGrady on February 16, 2011 by J.D. Mo. TNT’s David Aldridge is twittering that the Bucks will send Kurt Thomas and Francisco Elson to the Bulls for G-F John Salmons. Frank at Brewhoop has been tracking trade rumors this week. JSOnline has confirmed the news. Salmons is headed to Milwaukee but there’s no note on who the expirings from Milwaukee will be. Kurt Thomas is apparently NOT part of the deal, some sources said. Chicago Tribune reports that a deal has been reached “in principal” and that it’s Thomas and Elson for Salmons, but that the Bucks could “substitute” Hakim Warrick for Thomas. Problem is, Warrick’s $3 mil. contract can’t be substituted for Thomas’ and have the deal fit under NBA trade rules. Carlos Delfino‘s contract would work. Ball Don’t Lie has a trade deadline post that will be updated through 3pm tomorrow. Apparently the trade may be expanding, but Salmons is definitely headed for Milwaukee. The Bulls official blog is also keeping tabs. The 6’6″, Salmons, a 20-pt. scorer when he was with the Kings last season has been odd man out fit in the Derrick Rose-Kirk Hinrich-Luol Deng mix in Chicago. The Bulls needed to clear some cap space to be in the summer 2010 free agent market (D-Wade, Chris Bosh, Amare Stoudemire etc. ), and Salmons had an early termination option for 2010-11. It would have been no surprise if he had opted out of Chicago. In Milwaukee, Salmons would start at shooting guard, with Charlie Bell likely to return to a reserve role. Salmons came to the Bulls last season as part of the Andres Nocioni-Brad Miller deal right before the trading deadline. With Deng sidelined, Salmons filled in at small forward and averaged 18+ pts per game as the Bulls drove past the Bucks and Pistons into the playoffs. With Deng healthy and playing 38 mins per game, Salmons is playing shooting guard, but shooting just 10 times per game and scoring 12 ppg. He’s shooting well from Downtown, which never hurts a Scott Skiles team coached to launch ’em. Unless Salmons is little more than a less prolific version of Michael Redd, this trade improves the Bucks and doesn’t help the Bulls — especially if KT and Elson are the two involved. Somehow, I think Carlos Delfino’s name may come up, Hak Warrick’s already has. No matter which of the expirings are used (Luke Ridnour’s name has not come up), this looks good for the Bucks and not so good for the Bulls … for now. However, Chicago’s priority now is clearing cap space to make a run at D-Wade, Chris Bosh or other summer free agent options. Note: backup center Elson is on injured reserve and is expected to stay there for a few more weeks. UPDATE: Seems Thomas and Elson may stick … it to the Bulls. What a terrible trade for Chicago – Elson is on the injured reserve and Kurt Thomas has very little game left. Again, the latest is that the trade is expanding but that Thomas may or may not be involved. It came from Cleveland. “It” in this case is a monster built to win the NBA championship. Somehow, someway, the team with the best record in the league, running away with the top seed in the East, got better before Thursday’s trade deadline. Just an hour or so ago, the Cavs announced that they had traded center Big Z (Zydrunas Ilgauskas), a first round pick and draft rights to a guy named Emil to the Wiz for former All-Star Antawn Jamison, a big forward with a scoring game who should fit right in with Lebron and the rest of his beastly Cavs. Big Z was in the final year of his contract, paying him $11 mil. this season. With Anderson Varejao continuing to improve and with Shaquille O’Neal in the fold, Z became expendable. If healthy in the playoffs, Shaq and Andy will get the big man minutes. Jamison isn’t the outside shooter that Big Z is but he’s got a more versatile offensive game and younger legs. The Clippers are involved in this deal, too, and the Cavs will pick up backup point guard Sebastian Telfair. The Wizards get former Buck Brian Skinner and Al Thornton, a couple of rugged big men to play with Big Z and Brendan Haywood. Drew Gooden, another rugged, veteran big forward, will go to the Clippers. The Wiz just might have improved with this trade as well, particularly in the paint, where center Haywood this season has already given Andrew Bogut some problems. The Bucks are 0-2 against the Wiz with two left to play (both in early March). The Bucks have two to play against the Cavs. Meanwhile, the Bulls left shooting guard John Salmons at the hotel this evening in New York, a good sign that the Bulls GM John Paxson has another trade deadline deal good to go. This will be the third straight season the Bulls have hooked one up in the 24 hours before the deadline. Last season Paxson acquired Salmons and Brad Miller from the Kings. Salmons hasn’t had a good season. The Bulls have Luol Deng healthy and highly effective this year at small forward, and Kirk Hinrich and Derrick Rose running the show from the guard spots. Salmons was the odd man out. The Bulls have been mentioned as a team involved with the Rockets efforts to dump Tracy McGrady and $23 million contract in New York. Brewhoop runs down some of the T-Mac possibilities. Now it seems that Salmons is headed for Milwaukee! Ray Allen is still a Celtic, despite all the rumors this week. I could never see the Celtics capitulating to the Cavs and Magic and Hawks by giving up their title hopes. Trading Ray Allen would be the white flag waving from Boston. As for the Bucks, I’d really love to see them figure out a way to bring Ray back, of course. I suppose the Bucks could send to the Celtics Luke Ridnour, Charlie Bell, Hak Warrick, Kurt Thomas and Stackhouse. A Ray Allen-Brandon Jennings backcourt would send Bucks fans to the ticket office in droves, precisely what the franchise needs now that Scott Skiles and Bogut and Jennings, Mbah a Moute and Ilyasova have this thing headed in the right direction. But I can’t see the Celtics trading Ray, and am pretty sure the rumors to that effect were those of the made-up ESPN sort. The Celtics do appear about to trade Eddie House to the Knicks for Nate Robinson in a deal that will be announced sometime THursday. This entry was posted in The Jinx and tagged Antawn Jamison, Ball Don't Lie, Carlos Delfino, Chicago Bulls, Cleveland Cavaliers, Francisco Elson, Hakim Warrick, John Salmons, Kurt Thomas, Milwaukee Bucks, Milwaukee Bucks trades, Washington Wizards, Zydrunas Ilgauskas on February 18, 2010 by J.D. Mo.